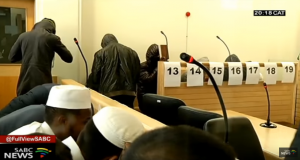 The case against 11 suspects charged with the Verulam Mosque attack and terrorism has been postponed. The state added two more charges and requested more time for further investigations. The 11 suspects were back at the Verulam Magistrate’s Court, aggressive and threatening to shoot dead journalists. They refused to be filmed by the media. The state added terrorism charges and also asked for more time for further investigations. The magistrate postponed the case. “The prosecutor in court did advice the court that we will be bringing an application for a request for voice samples of accused number one. The matter was then postponed to 15 of April for the defence to look at the basis of that request and we’ll see on the 15th whether that application by the state will he allowed. Added to that, the state did add further charges to the provisional charge sheet and that’s about five charges. Those charges to speak to the bombings that took place at the Woolworths stores and one incident where a bomb was placed under a car,” says NPA’s Natasha Ramkissoon-Kara. Accused number one, Farhad Hoomer, is out on a bail of R200 000. The bail for the other seven ranges between R3000 and R150 000. The post State adds charges against Verulam Mosque “accused” appeared first on SABC News – Breaking news, special reports, world, business, sport coverage of all South African current events. Africa's news leader..